A picture worth at least a few words, which are: we are still expecting some cold nights coming up, so if you have tomatoes in the ground or are putting them in soon, give them some protection! I couldn’t wait any longer to get some of my huge plants in small pots into the ground, so I broke out all the protection devices I had lying around. Also in the photo: one tomato left uncovered to see how it does in comparison. Off camera: stuck two with my cabbages under a big row cover tunnel. If you don’t have any of this stuff, you can still protect your plants. Just watch the weather forecast and throw an old sheet over the plants when temperatures dip below 50, especially if there’s wind. (Use rocks to hold it down. Also cheap.) Your plants will live without protection unless we actually get a frost, but their growth will be slowed and perhaps stunted. Yes, indeed, I should have waited to start my tomatoes so I could hold them inside until well after Mother’s Day. My only excuse is that some of us MGs did a little grafting project (with which I had some success!) 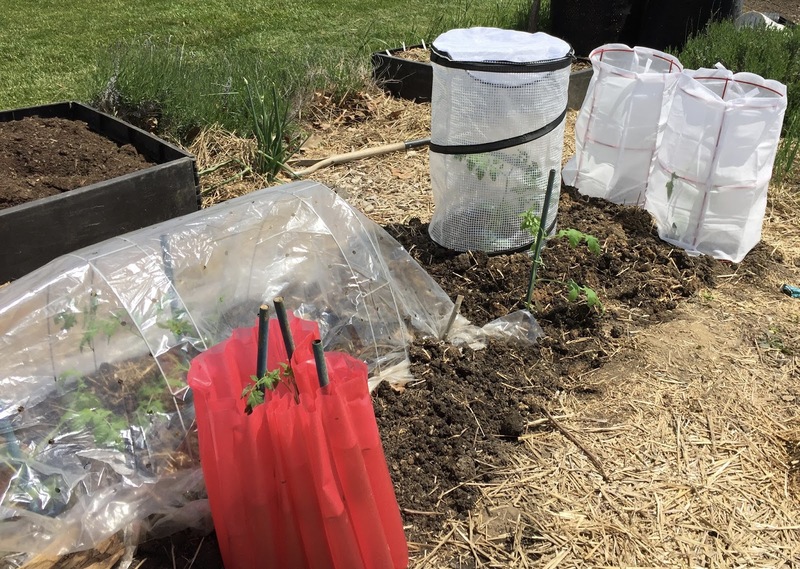 and had to get both rootstock and scions started pretty early since the grafted plants are set back in growth during recovery. And for whatever reason I decided that since I was using a 50-cell tray to start the plants, I needed to fill every cell… plus start some others a week later just in case… anyone need some tomato seedlings?